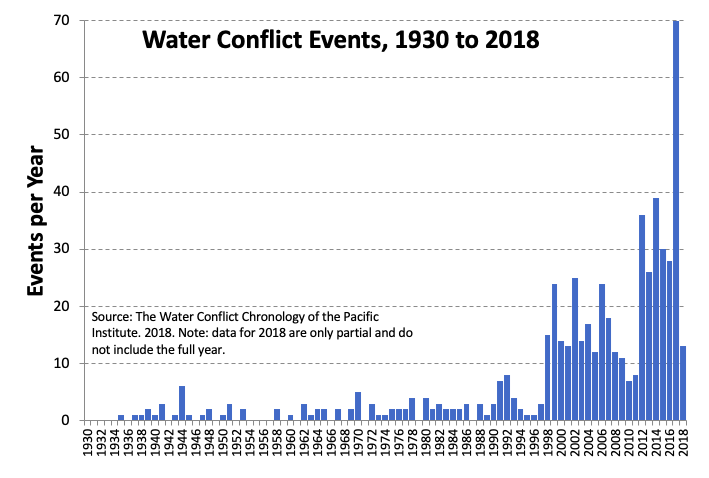 January 23, 2019, Oakland, Calif. – The Pacific Institute has just released a new update to its Water Conflict Chronology, adding over 100 new entries identified from news reports, eyewitness accounts, and other conflict databases. The Water Conflict Chronology is the world’s most comprehensive open-source database on water-related violence. Created by the Pacific Institute in the 1980s, it includes all known verified instances where water and water systems (1) trigger conflicts; (2) are used as weapons in conflicts; or (3) are targets or casualties of violence. Among the most notable new cases are attacks on civilian water systems in the numerous ongoing conflicts in the Middle East, especially in Yemen, Syria, and Iraq. Also notable are the growing instances of violence in parts of Africa where traditional herders and farmers are competing for scarce water resources as populations increase, extreme drought expands, and limited water becomes harder to reach and use. Most of the new entries are from the past two decades, though a few are from the late 1960s and 1970s. As with all previous entries, each event is identified with the date, location, category (trigger, weapon, or casualty), a short description, and a verifying citation or source. The Chronology now includes over 600 cases of violence associated with water resources and systems and shows a clear acceleration of reported violent events in recent decades. The Pacific Institute’s work on water and conflict has increased efforts worldwide to identify strategies for reducing the threat of violence over water resources, including technical and engineering solutions to improve access and efficient use of water, the application of political and legal tools to protect civilian water systems, and new economic approaches to address inequities in freshwater availability and affordability. For more information or to arrange a time to speak with database creator Dr. Peter Gleick, Pacific Institute President Emeritus, please contact Communications Manager Rebecca Olson at rolson@pacinst.org or 510-251-1600 ext. 117.